With the weather starting to dwindle, and the months starting to shift into that volatile time, I was eager to make use of a three-day window I had in late September. 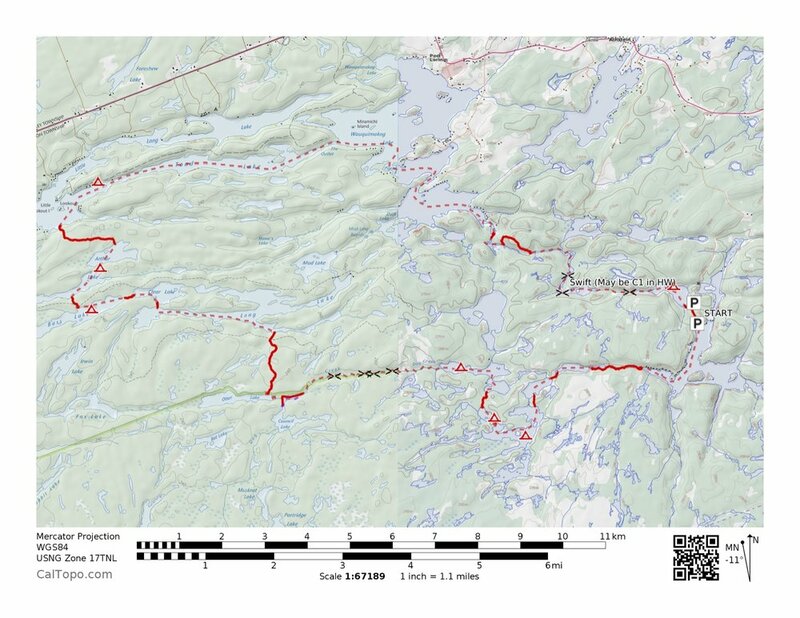 Looking for unique routes, I started looking outside of our Provincial Parks for crownland options. Having no luck online and having little time to research I messaged our buddy Brad from Explore the Backcountry for his take on the situation. He recommended a route he did back in 2015 in the Port Loring area which he assured would have its fair share of adventure. He sent over his gpx coordinates and I overlayed them onto a topo map which I would use for my reference. On this trip a good friend, Eric, joined me. He is a great guy to trip with because he has an open mind and thrives on routes that have uncertainty, which is great for exploratory routes. Port Loring is a small town off Highway 522, Northeast of Noganosh Provincial Park. The area consists of crownland with private property scattered on some of the more easily accessible lakes. The route starts in Legrou Lake Landing, a public boat launch which does not require a permit. From here the route takes you on a counter-clockwise loop into Dutchman Lake. 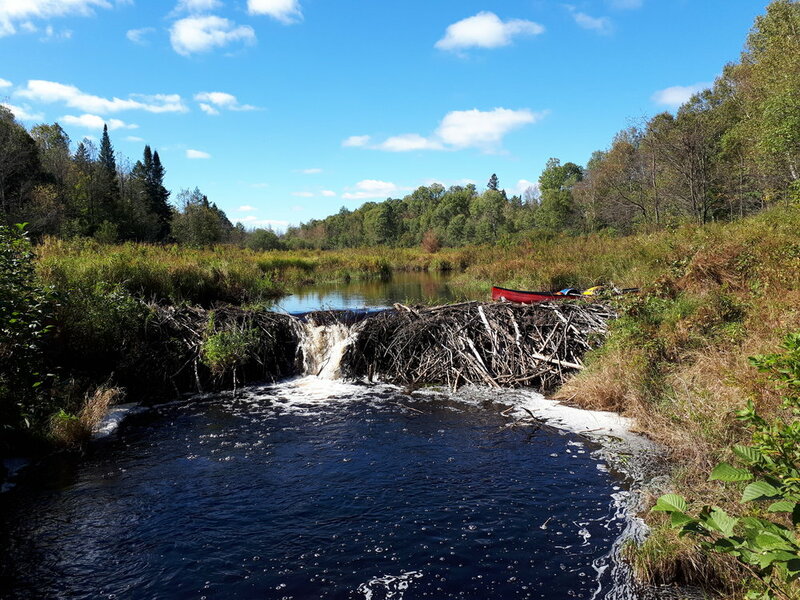 To enter Dutchman Lake you can portage 650 m from the launch or you can drive your vehicle North on Legrou’s Lake Road to an ATV path which requires only a 100 m portage (the better option). Once on Dutchman Lake, head west to the Dutchman chutes which will take you to a bony Pickerel River. Getting down the river is very dependant of water levels. For us, being late September, water was low which required us to wade for 1 km. The river has some dramatic rock faces and some sections which could potentially be Class I’s in higher water. Near the end of the river there is a waterfall which cannot be run. Take-out on the river right which will lead you to an ATV trail. Follow the ATV trail for 1000 m around the waterfall. The portage will bring you down the river which will then require you to paddle less than a km to another large set of waterfalls which will require a portage on river left. From there you will enter Wauqimakog, a cottage country lake. Paddle Northwest on Wauqimakog for 6 km. After the third large peninsula on your left, head East towards Toad Lake. Toad Lake is a narrow waterway which is where we found hundreds of freshwater jellyfish, an invasive species which is believed to have first come from the Yangtze River in China. This was also the Lake we decided to camp on night two. Continue on Toad Lake for 7 km until you reach Lookout Island. From there head south to a dock which marks the take-out for 1600 m portage into Arthur Lake. The portage is an ATV trail which is used by hunters to reach hunt camps on the back lakes. The trail is well maintained and has three main right-hand turnoffs. Take the second right, the first and third lead to private property. Once on Arthur, the cottages disappear and only the odd cabin is seen. The portage leaving Arthur requires some bushwacking as there is no obvious trail. Head Southwest on the lake until you see a cabin; 100-meters East of that cabin is where we portaged. The route started with a steep incline and then flat ground for ~ 300 meters. Although a bushwack, the forest is a well matured mixed stand and therefore not relatively thick. The following three lakes (Bass Lake, Clear Lake and Long Lake) are a quick leapfrog split up by short 245 m portages. At the bottom of Long Lake there is the longest portage of the route, a 1700 m trail used by snowmobilers. The trail is obvious and marked as “Trail 510”. A reference for the many snowmobile paths that pepper North-Central Ontario. Follow 510 to Otter Lake. Otter Lake does not have any campsites. We stayed on the lake for the second night where we made use of a flat section off a rocky embankment. Dog Creek is a meandering, beaver influenced wetland which becomes more choked up the farther you venture East. Along the creek there are five (5) notable beaver dams, some being over 5’ high. Although traveled late in the year, we were still able to make our way down the creek with few complications. The last 300-meters gets very restrictive and requires some effort to push through. Once on Dog Lake there is more leapfrogging through four (4) small lakes (Dog Lake, Big Hungry Lake, Little Hungry Lake and Pup Lake). This section of the route felt the most remote and had some of the most beautiful scenery. If time were on our side, I would have pushed to spend more time on Big Hungry Lake fishing for Smallmouth Bass. Overall this route is a great introductory route to experience the Ontario backcountry outside of our Provincial Parks. Sections off the larger lakes felt relatively remote and gave a great sense of adventure. The lack of marked portages, campsites and canoeists also lead to that exploratory vibe. I recommend this route to any canoeist looking to wet their feet in some crownland tripping.